So many villages in Europe have special traditions or a unique custom that add color and culture to their beauty and charm. One such town is Appenzell, nestled in the green, rolling hills of the Alpstein region in Switzerland. 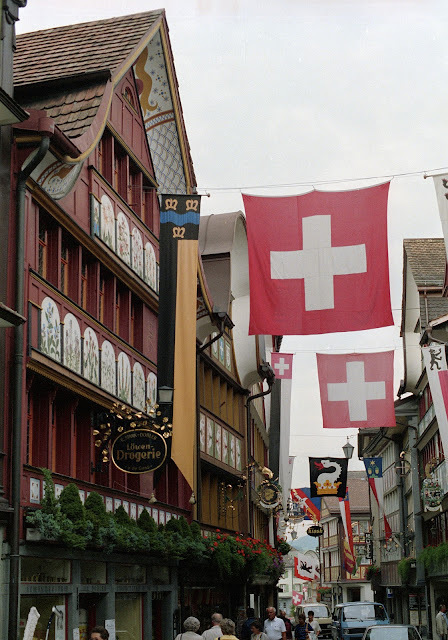 Appenzell is a quintessential Alpine village, with timbered chalets, blooming geraniums, distinctive buildings with painted façades, narrow roads, and rustic old barns. Yodeling and alphorn playing are strong rural traditions to the people of this lovely area. 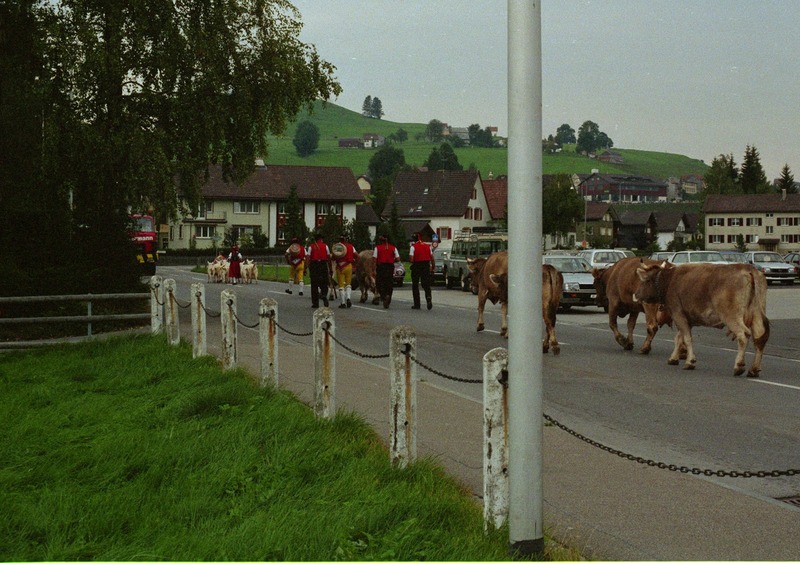 Appenzell’s very unique custom, that is a memorable event for children of any age, is the ceremonial descent of the village cows, which takes place every year in autumn. Sure, cows are herded from pasture to pasture all over the world, but not with such a happy celebration as this. 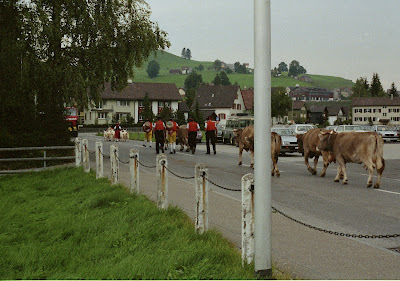 The Appenzell cattle are led down the mountain by men and women dressed in their traditional costume, considered to be the most exquisite such ensembles in the country. Villagers perform folk dances and play music and serve honey cake and pear bread. Many of the cows are miniature, oddly enough, and wear enormous decorative cowbells. (Strangely, many of the locals are kind of hobbit-sized, too. Seems a regional thing.) The entire atmosphere is festive and wonderful. If you can’t make it to Appenzell during the fall, there’s plenty of other activity year-round. Famous also for its dense network of hiking trails, there are leisurely walks among the rolling hills and there are challenging tours and climbs up the Alpstein’s 8000-foot-high rock formations. There are stunning panoramic views, especially atop Säntis, the highest summit of the surrounding mountains. In the winter, you can enjoy the area’s 125 miles of cross-country skiing tracks and three nearby popular ski resorts. For an interesting side trip with your kids, ride the cable car from Appenzell up to Ebenalp. 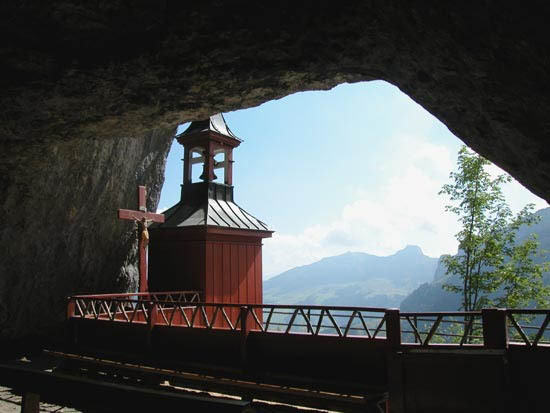 Walk about 15 minutes along a gentle trail and through two caverns to visit the Wildkirchli cave and its chapel. The Wildkirchli cave was inhabited by hermits from 1658 to 1853 and is open to the public. 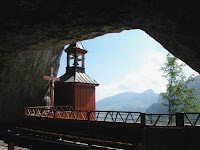 The small wooden chapel that clings dramatically to the rock face at the cave’s entrance was built by the hermits who once lived there. 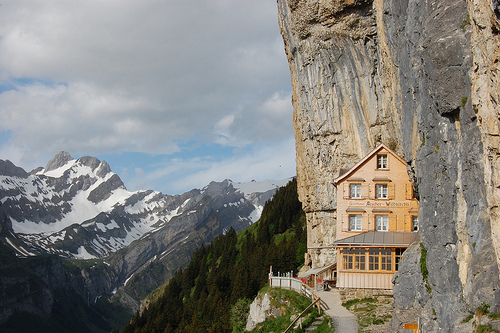 Looking even more precarious, and actually built into the rock itself, is Berggasthaus Äscher, an inn built in 1805. Enjoy a hearty lunch at Äscher and head back down the mountain or spend the rest of the day hiking along the beautiful trails egressing from Ebenalp. Have lunch here at Äscher, or stay the night! Now that's a house with a view - just don't sleep walk at night.